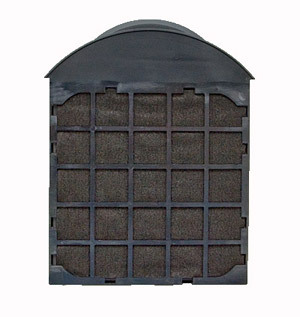 This is the replacement accordion paper filter that sits in the rear slot of Hottop roaster models. The company suggests replacing the filter every 30 to 60 roasts. The housing is made of plastic and inside are two layers of filtration. The filter can only fit in one way. The side facing the front of the roaster has charcoal filtration; the side facing rear is accordion folded white filter paper. Outside air flows into the roaster from the rear, passing through both layers of filtration.